"Recruitment, Diversity and Success" is a print-on-demand compilation of articles from Inside Higher Ed. 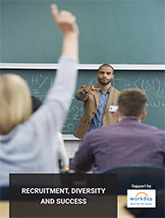 The booklet, which may be downloaded here, features articles on issues related to the recruitment of diverse student bodies and examples of institutional experiments and successes. Inside Higher Ed's editors hosted a free webcast discussing the issues explored in the compilation. Click here to view the on-demand version of the webcast. The booklet is made possible in part by advertising support from Workday.